Books - Think on..truth, honesty, just, pure, lovely, praiseworthy..
Ginger Ladybug's Adventures: "The Stream"
Ginger Lady Bug is a “big and beautiful” character that overcomes hurtful teasing and turns her size into a plus by carrying Nellie Gnat who cannot fly. One sunny morning Ginger Lady Bug overcomes sadness of being teased about her size by taking a trip down the stream. She invites Nellie Gnat to join her and since Nellie Gnat cannot fly, she carries her on her back. The two have fun floating on a leaf, until Freddy Frog jumps into the stream and almost knocks the two friends into the water. This first adventure brings laughter, excitement, anxiousness, peacefulness, anticipation and a new friendship. More adventures are to come for these two best friends. The vibrant colors and illustrations take the reader into Ginger Lady Bug’s fun-filled world. 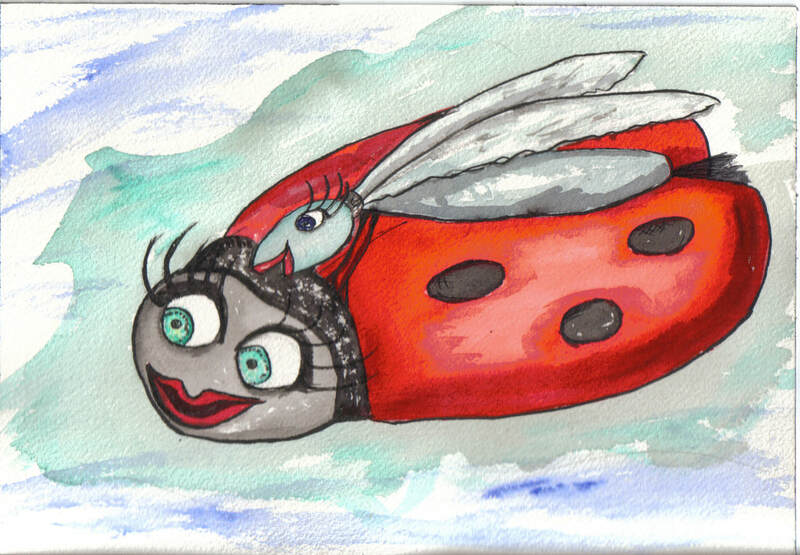 "Morro Bay by the Sea"
Ginger Lady Bug is a “big and beautiful” character that overcomes hurtful teasing and turns her size into a plus by carrying Nellie Gnat who cannot fly. They met in their first adventure The Stream. In this second adventure, Ginger Lady Bug and Nellie Gnat wake from a nap to find themselves at Morro Bay by the sea. They meet Micky Angel Wing, a beautiful dragonfly; Kayla the Clam; Sammy the Seal; Maverick the Cat; and two kittens, Katie and Ditto on this adventure. The vivid colors bring the wonder of the sea to the reader and listener. Senses come alive as the pictures and words describe the cool, salty breeze at Morro Bay. This second adventure takes reader and listener on a trolley ride, to the top of Morro Rock, and yes, they meet Maverick the Cat who sleeps right through the adventure. Ginger Lady Bug is a "big and beautiful" character that overcomes hurtful teasing and turns her size into a plus by carrying Nellie Gnat who cannot fly. They became best of friends in the first adventure "The Stream". In the second adventure they traveled to "Morro Bay by the Sea". In this third adventure Ginger Lady Bug and Nellie Gnat visit the "Blossom Trail" where they meet Macy and Mallory twin honey bees, and the Blues Birds; Bryce, Brennan and McKinley. The vivid colors take the reader into acres of orchards painted with blossoms that produce various fruits and nuts. This adventure shows how bees gather nectar from the blossoms to make honey and pollinate each blossom so it will produce fruit. Readers young and old will find this book a breath of fresh air as they travel to the beautiful orchards of "The Blossom Trail of Fresno County in California.